I have been seeing all the negative ads by so called carpet dry cleaning companies who claim that Steam Cleaning or Hot Water Extraction will harm your carpets, harm your children, harm your pets, and leave your carpets sopping wet, where mold will grow. If you have a reputable company such as Triangle Carpet Cleaners, clean your carpets, then absolutely non of this is true. If you go out and hire a steam cleaning carpet cleaner, who will clean your whole house for $89.95, then anyone of those claims could be true. Some carpet dry cleaners are like insurance companies who want to scare you to death, so that you will buy from them, or better yet car salesmen who manipulate you by not telling the truth. They also claim that they sanitize carpets, and I honestly do not have a clue how they do that without the use of some chemicals. Water extraction does your basic sanitation with very hot water, and with our company, it is over 200 degrees. My son just traveled recently to clean my daughters carpets. Do you think for a minute that I would allow any Steam Cleaning to happen around my grandson or family if I thought it was going to hurt them. By the way, the place they rent, had been dry cleaned the last time, and you can not believe how much residue and dirt, had been left behind in the carpet. As you see in the picture above, the difference between Steam Cleaning and Dry Cleaning, you will notice closely in the upper right hand corner of the picture, where the cleaning was stopped, and you can see quite a difference in the original color. 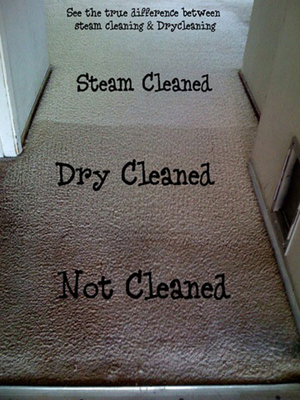 You have to make the decision whether you want your carpets so so clean, or really clean. I challenge any dry cleaning company to clean any family room that has been lived in. They will clean half a room and we would clean the other half, and you would see the difference. We clean after dry cleaners all the time, and customers can not believe the difference we make. Yes, your carpets will be slightly wet when we finish, and normally takes about 4 hours to dry. It all depends on the climate in the home, and air movement.